We talk to a lot of folks at nonprofits who aren’t happy with their organization’s website. Usually, the site is failing to connect with audiences and accurately reflect who they are. Oh, and in almost all cases, it looks dated and stale. As a result, organizations sometimes ask us to “refresh” or “reskin” their website. In other words, they want the design of their site updated so it looks more modern, but want the existing structure, navigation, and technology to remain in place. While there’s nothing wrong with wanting your site to look better, asking for a design refresh like this can be a band-aid fix for much deeper problems. Every website is built on four foundations: brand, design, technology, and content. If your site isn’t performing, you need to invest in a redesign that takes all four of these elements into account—assessing how each serves your users’ needs and impacts their experience of your website. Why? Because on average, users only spend 10-20 seconds on a web page before they leave, and according to a 2006 study, they can develop an opinion of your organization after as little as 50 milliseconds of being on your site. That means it needs to make a good impression on all fronts quickly, or else you risk losing potential advocates. If your website has been “refreshed” to look modern, but users still can’t find the information they’re looking for, they’re not likely to stay interested for long. First off, you’ll need access to and familiarity with your website’s content management system (CMS). If you’re unfamiliar, most CMS’s offer tutorials for making changes and open source platforms like WordPress and Drupal have plenty of educational resources. Assuming you’re good to go there, you’ll want to start prioritizing your content. Rewriting the content of your website is no small feat, especially if you’re dealing with a large, information-heavy website. Start with the pages that users visit the most: your homepage, your about page, etc. If your organization tracks analytics, even better! You can check which of your pages are visited most and add those to the high-priority list. You’ll also want to gather a team to help rewrite the content. Try to choose staff who work in different areas of your organization, with varying areas of expertise so the content is as accurate as possible. Just make sure that one person is tasked with being the final eyes on content, and is responsible for entering content into the CMS. That way, you can better ensure that the content voice and style across pages stays consistent. We typically recommend using a spreadsheet like this one to keep track of the process. "For organizations whose work revolves around thought leadership, if how content is designed isn’t on par with the quality of thinking it contains, they’re selling themselves short." A clear understanding of audiences is the key to determining how you should write and present the content on your site. Who are you writing it for? Keep in mind that this will likely vary page by page. When your team is prioritizing the pages to rewrite, it can be helpful to note which of your audiences will be frequenting each page. If you’re an organization that provides emergency health services, for example, a ‘Get Help Now’ page would likely be most commonly visited by clients. Think about their content needs when they visit this page of your site. What do they need to know? What content is most important to them? Have you ever stumbled upon a webpage with large blocks of dense text and thought “Wow, this looks SO interesting! I can’t wait to read it all!” If you’re like us, probably not—you’ve likely found it daunting! One of the simplest ways you can make your website more effective is by breaking up large, dense blocks of text whenever possible. In other words, stop writing so much! This holds especially true for more general landing pages, like your homepage and about page. These pages should be easy to scan, so users can quickly understand who you are, and then learn more by digging deeper into your site. One of our favorite books on this topic一appropriately named Content Design一details the ways in which the human brain reads and processes text. Spoiler alert: we’re not really reading every word. In reality, people only read about 20-28% of a page’s content online. We look for patterns and words we understand in order to comprehend content as quickly as possible. You can nerd out more about how people read online here, but suffice to say that the less words you can use to inform a reader, the better they’ll retain information and the more interested they’ll remain in exploring your site further. When users take the time to explore your site deeper than overview pages, you can and should display long-form content, like published research or program descriptions. Such content doesn’t lend itself well to being shortened, so don’t stress yourself out thinking all the content on your site needs to be scannable. While design is a key asset in making long-form content like this more digestible, there are also some content design techniquesyou can adopt to maximize engagement with this more complex content. The main takeaway here is that by making the more general pages of your site quicker and easier to read, you increase the likelihood that users will be more interested in reading your longer-form content, learning more about your organization in the process. Rewriting and trimming down your content will only get you so far. Without proper formatting, the text on your site might still be difficult to parse through. 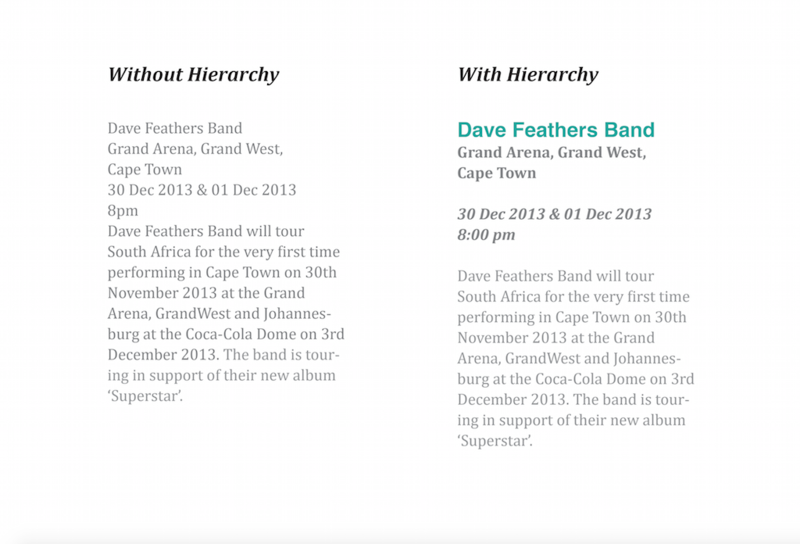 By establishing typographic hierarchies, you can establish an order of importance for your content with different text sizes, colors, and/or emphasis. This makes it easier for readers to quickly skim and digest your content. Plus, when text is properly formatted, it encourages users to read more, and engage more deeply with the rest of your site. Don’t believe us? Here’s an example that makes the power of formatting pretty clear. Which content block is easier to digest? For more tips on writing and formatting for the web, check out parts one and two of our complete guide. Once you’ve revised and reformatted your content, you’ll want to make sure users can find all that great information you worked so hard to redesign. By incorporating hyperlinks into the content of various pages of your site, you can encourage users to explore more of your work in different areas of your site. For example, if someone is reading your programs page, they might also be interested in reading some client stories, annual reports, or learning about ways they can volunteer. Have you noticed us using hyperlinks throughout this article? By now, you should have all the tools you need to start redesigning the content of your website. Of course, content alone won’t fix all your website woes. Brand, design, and technology are equally important elements of a great website. But addressing content concerns will help make the information on your site more digestible, and increase engagement with your audiences as a result. Plus, the more you work on your content now, the better off you’ll be when you secure the budget to begin a full website redesign project. Happy writing…or should I say, content designing! Allison brings a diverse perspective from the government, nonprofit, and social entrepreneurship sectors to her role as Communications and Outreach Strategist at Constructive. A passion for writing paired with extensive experience in marketing, social media, events management, and research guide her efforts to lead Constructive’s digital and content marketing strategies, establish and maintain new partnerships, and apply a strategic communications-lens to client engagements. 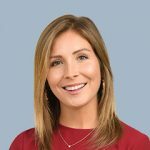 Prior to Constructive, Allison worked at Third Sector Capital Partners in Boston, MA supporting the Communications and Business Development teams. She received her BA in Political Science and International Affairs from Northeastern University.